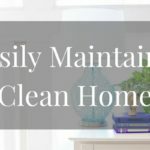 Do your bathrooms need to be deep cleaned? 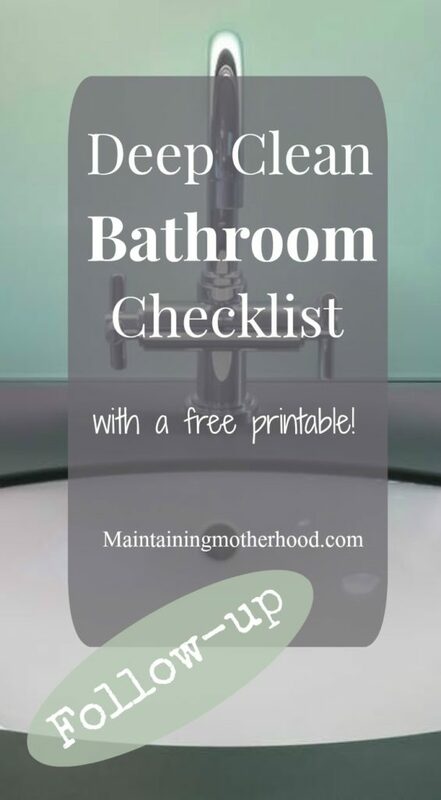 Follow this simple Deep Clean Bathroom Checklist and your bathrooms will sparkle in no time at all! 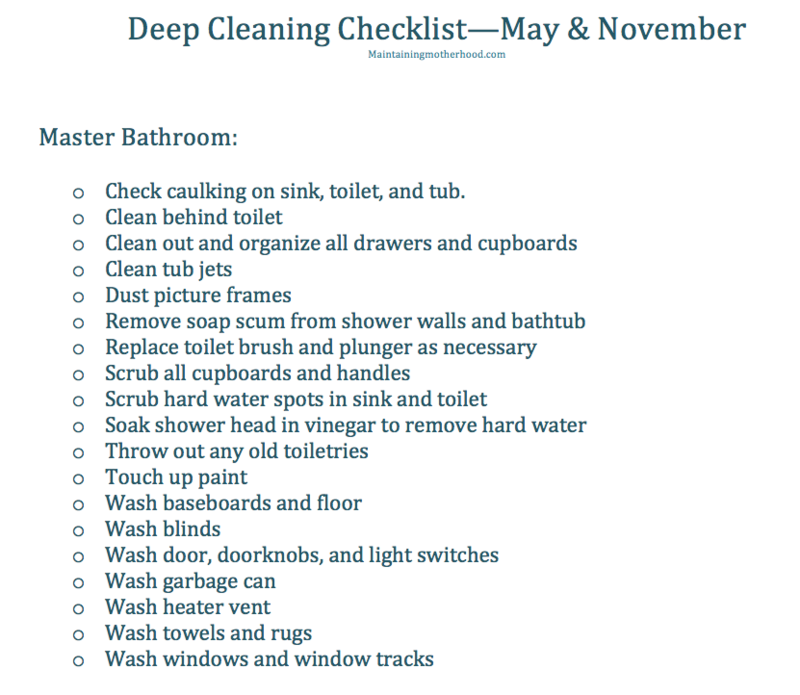 This month was the month where we deep cleaned the bathrooms. I am trying to really implement the idea of living with less and keeping only those things that I love. 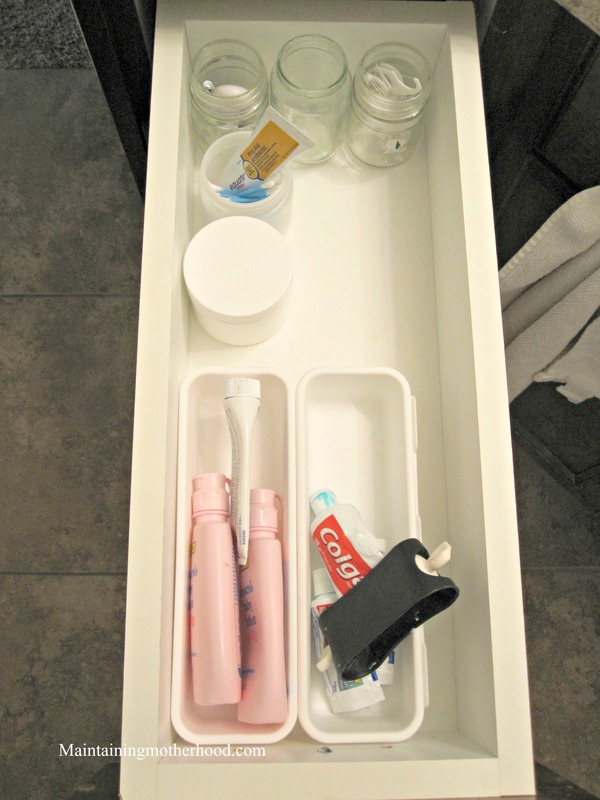 The details encompass all our bathrooms, but I have only taken pictures of how we organize our main bathroom. There are no windows in there, so excuse the poor lighting. 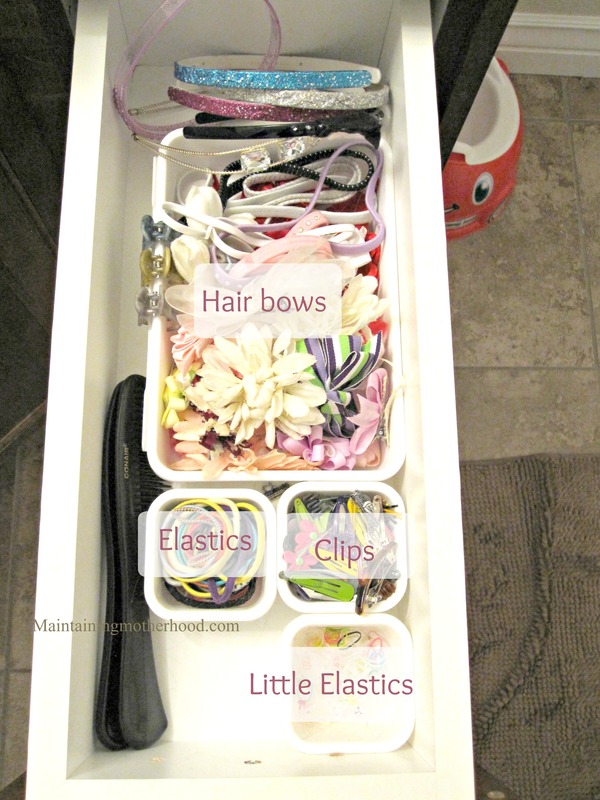 Little hair ties and bows seem to miraculously appear in our house, yet we use the same ones every single day. I got rid of all hair bands that were stretched out, or the styles that we never use. Hair clips that were broken or missing half of their sparkles were weeded out as well. Hair bows that never got worn or that only matched an outfit that no longer fits anyone were not saved. I bought little organizers to separate hair things out. This helped me make the final cut on many things. If it didn’t fit in the container, it didn’t get kept. We also had TONS of combs that were never used. I kept only the ones we use on a regular basis. We had the same shower curtain from when we first got married still hanging up in the bathroom. It was still in great condition, but it bugged me because it was SUPER short on this shower. I got a longer shower curtain that is just plain white to simplify and brighten the space. I also needed to replace our heavy duty plastic shower curtain liners and opted for a fabric mold and mildew resistant one this time. It will be much easier to wash as time goes on. I debated on replacing our towels or not. I think I will hold off until next year. They don’t have holes or look ratty, they are just old. I will just take this as extra motivation to go to the pool and other fun activities that I don’t want to be taking a new towel to. I consolidated all of our first aid. We could probably wallpaper the bathroom in the supply of bandaids we have! I didn’t realize the short shelf life on some of these first aid things. I got replaced all expired medicines and first aid creams. I keep my makeup routine extremely simple, so I didn’t have much to get rid of there. I had a few lip gloss colors that I didn’t use, nail polish that wouldn’t open anymore, etc. We are pretty particular about hair gel for the boys in this family. 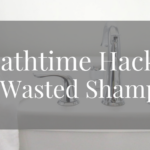 It has to be completely non-flaky since we have a couple kids that love to pick the crunchy gel out of their hair…For whatever reason we were still hanging on to the hair gel we didn’t love. Those got tossed out. Our toothpaste and extra toothbrush supply had dwindled, so I stocked up when they each went on sale. All the little samples of shampoo from hotels were put in the kid bathtub so they could use it up. I also compiled my Personal Care Kit for after the baby is born, and used the excess mini toiletries to make up a bag to take to the hospital! This really should say “linen closet”. 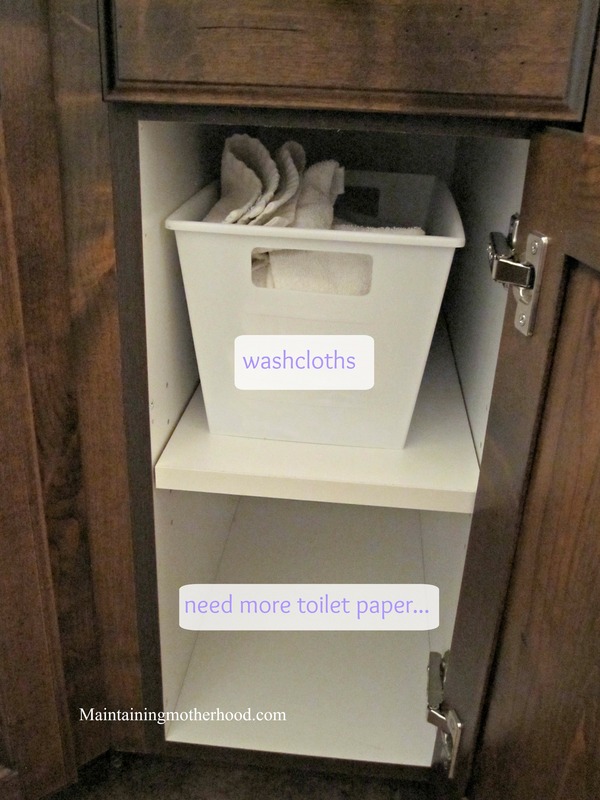 It is this super tiny little triangle shaped closet that stores next to nothing. I have some little dollar store bins to help me sort things. I know there are fancier labels out there, but I find that clear packing tape and a little sticky note goes a long way. You can easily change out the labels with no sticky reside left behind, and it isn’t the cute dangly kind that will get ripped off after awhile. We also store cleaning supplies and rags in a tote. 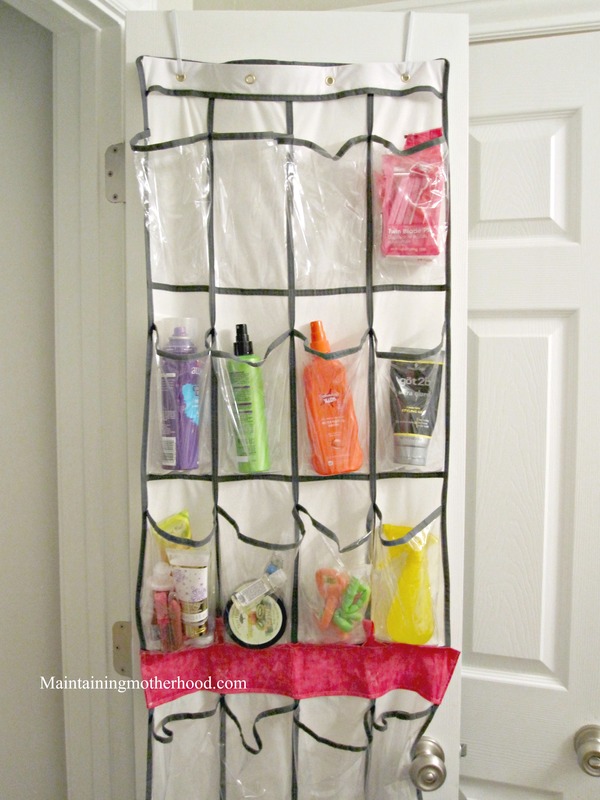 The everyday hair items (hair spray, detangler, gel) that I don’t want dumped out or played with by little ones, are in an over-the-door shoe organizer. We hang towels on hooks instead of trying to teach kids to fold and hang the towel without performing gymnastics tricks on the towel rack. We bought these shower rings that have a big enough knob decoration that the towels hang perfectly without having to worry about the ring falling off without the weight of the towel. and the vaporizer and the extra toiletries listed above. 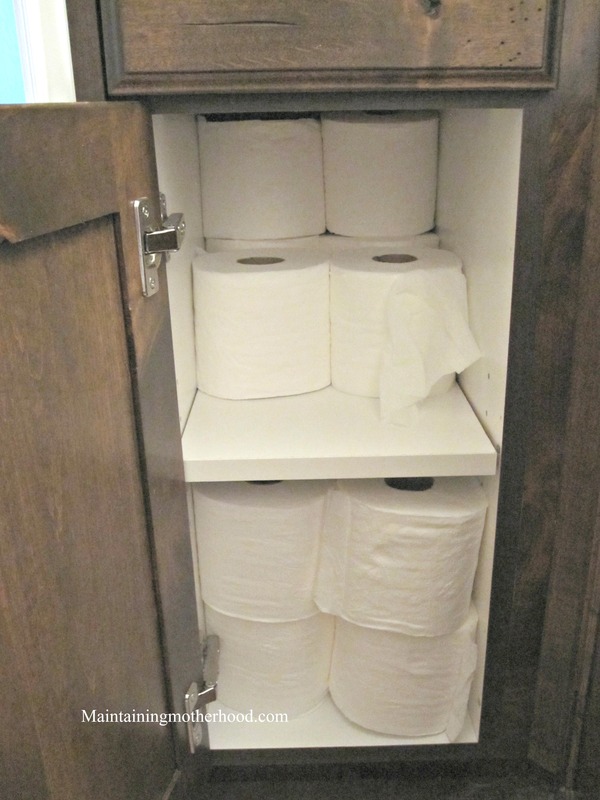 One drawer is for toothpaste, flossers, fingernail clippers, q-tips and extra lotions. The other is for the hair accessories. The counters are kept super simple. 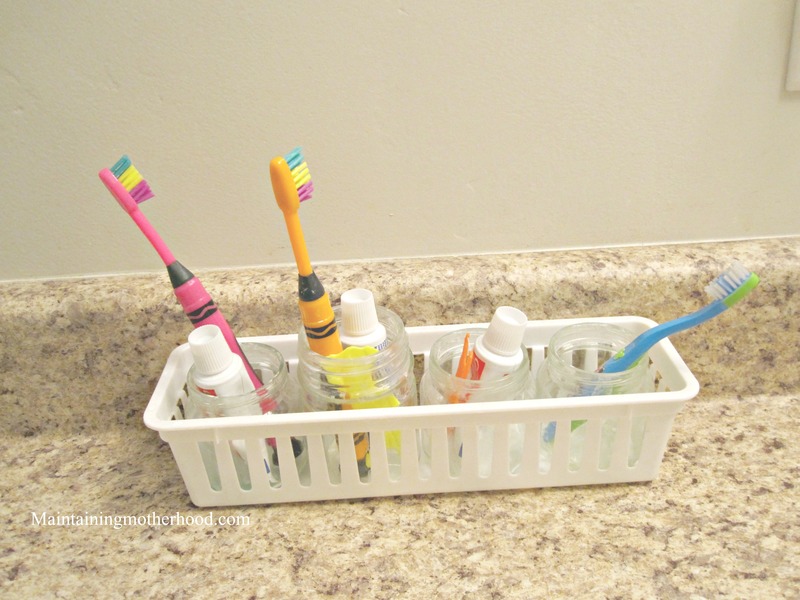 A bottle of pump lotion on one side, and the toothbrushes on the other. 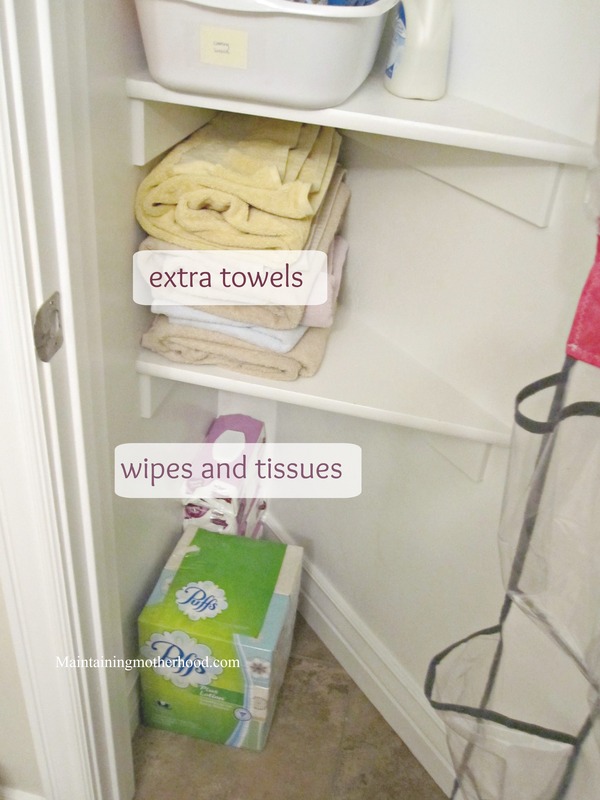 It’s easier to keep little fingers out of things and keep the bathroom looking clean when nothing is out! So there you have it! 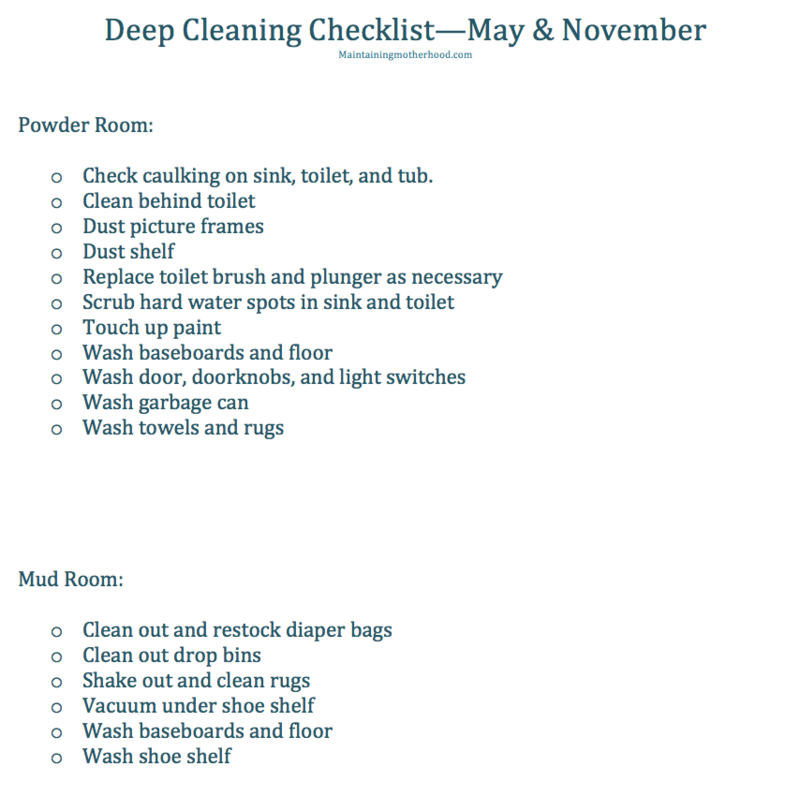 Our bathrooms actually stay fairly clean since the kids have the weekly chore of cleaning the bathrooms. 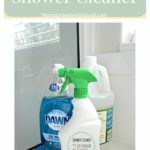 My deep cleaning mostly consists of getting the stubborn hard water spots out of the shower and toilet, scrubbing well behind the toilet, and decluttering all the bathroom items. 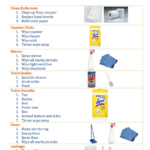 If you missed the Deep Clean Bathroom checklists, get your free copies here (just click on the images)! 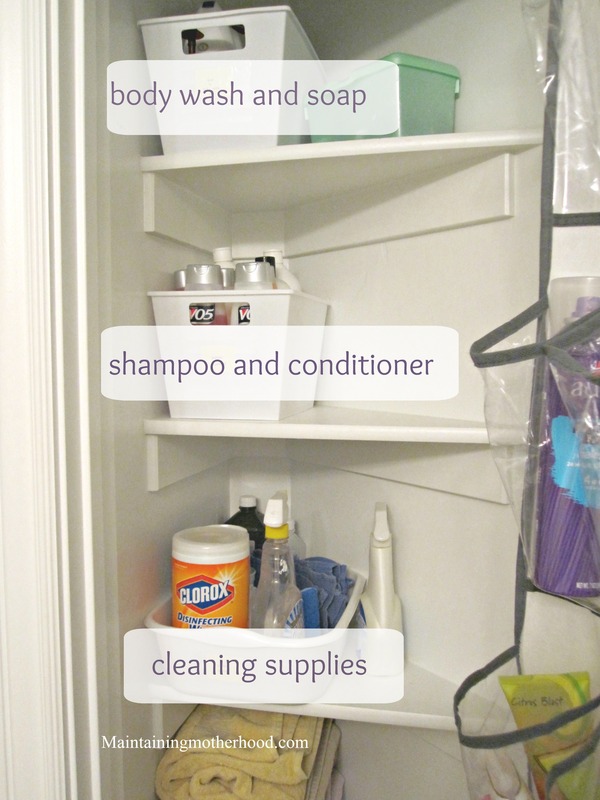 How do you keep your bathrooms clean?